The drive involve Dr Carlos Peralta from the University of Brighton’s School of Architecture and Design, HIV experts Dr Gillian Dean, Dr Jaime Vera, Dr Eileen Nixon from Brighton & Sussex University Hospitals NHS Trust and Dr Mary Darking from the University of Brighton’s School of Applied Social Science . 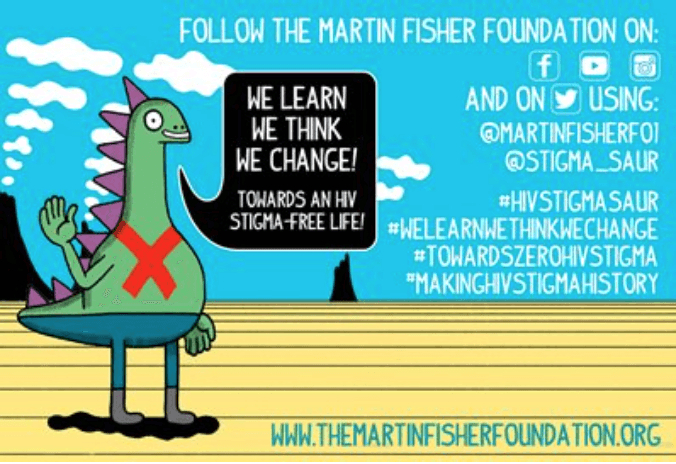 The campaign, part of a research project funded by Public Health England, is launched this month (July) by the Martin Fisher Foundation, set up in the city to take forward the work of Professor Martin Fisher, internationally-renowned HIV expert who died in 2015. The information initiative aims to change people’s perceptions and behaviours to eliminate stigmatising attitudes towards people living with HIV, and all university staff and students are being urged to join in and to spread the word. Another message is that while “HIV isn’t scary anymore; HIV stigma hurts and wrecks lives”. Project manager, Dr Liliana Rodriguez, from the Martin Fisher Foundation, said: “Please support our online campaign by signing up to our ‘Thunderclap’ which allows a single message to be sent from your Twitter, Facebook or Tumblr account on the launch date of our digital campaign to address HIV stigma and provide current information on HIV treatment and care. The Foundation has been working with local film makers, animators, illustrators, designers, patients, clinicians, and researchers to create a thought-provoking campaign which will convey accurate and consistent information to the general population of Brighton & Hove. Four ‘Don’t Be a Stigmasaur’ videos have been produced: 1 and 2 target relatives and close friends of people living with HIV (40-60-year olds); 3 targets the general population not living with HIV and aims to respond to people with false HIV stereotypes, and 4 targets a younger generation (16-24) and provides facts about HIV to dispel myths and misinformation about living with HIV. We also have personal testimonials from people living with HIV explaining how stigma has affected them’. Collaborating on the project are the University of Brighton, Public Health England, Brighton and Sussex University Hospitals NHS Trust, Brighton and Sussex Medical School, Diptico Design, patient representatives and members of the public. The campaign is now seeking media influencers, celebrities and sponsors to join. Dr Carlos Peralta, who led the design and creative aspects of the campaign, said: “A lot has changed but stigma and misinformation about HIV are still widespread. This entry was posted in Product design, Staff, What's on and tagged Brighton and Sussex medical School, Brighton and Sussex University Hospitals NHS Trust, Dr Carlos Peralta, Martin Fisher Foundation, Public Health England, Stigmasaur.